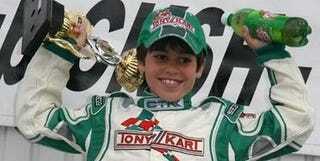 11-year-old two-time Canadian Karting champion Lance Stroll becomes the youngest person ever signed by Ferrari Racing to a development deal and training at the Ferrari Driving Academy. He also wins the title of luckiest kid ever. Lance will be the youngest ever recruit of the academy, but according to Ferrari Driving Academy director Luca Baldisserri, "He is very young, but he has already shown in karting that he is exceptionally talented. We will follow him step by step in his forthcoming events in North America and he will soon also take part in our courses at Maranello." Lance has been dominating the Rotax Mini Max division since he started racing in 2008, a season which saw him nominated Rookie of the Year in the Federation Sport Automobile du Quebec followed by a Driver of the Year nomination in 2009.